Met the gang after work for dinner @ 313 Somerset. 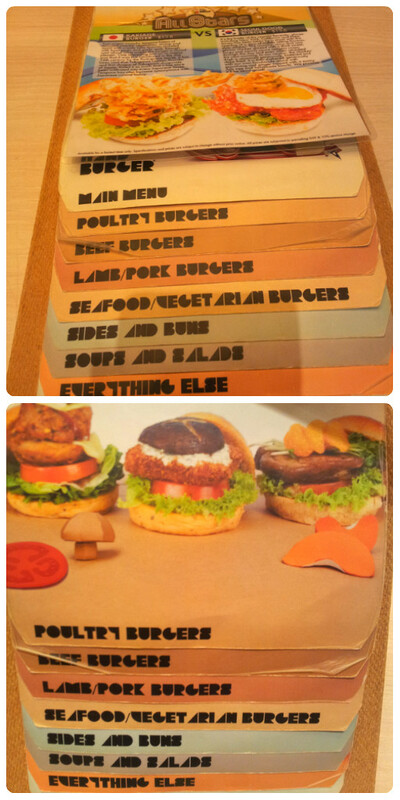 There’s wide range of food selections in their 3 dining areas, ie. Discover Walk where Marché Restaurant, Brotzeit German Bier Bar & Restaurant, Absolute Thai, Trattoria Italian Kitchen is; Food Hall on B3 where you can find takeaway foods and casual restaurants such as Din Tai Fung, F.I.S.H, The HandBurger, etc; and lastly Food Court on Level 5 which is the largest Food Republic Outlet. We decided to eat in The HandBurger @ B3 and according to them, everything was made from hand… When we reached there, a group of 3 was already queuing. We were next in line. Luckily, we were faster because the queue gets longer after a while. 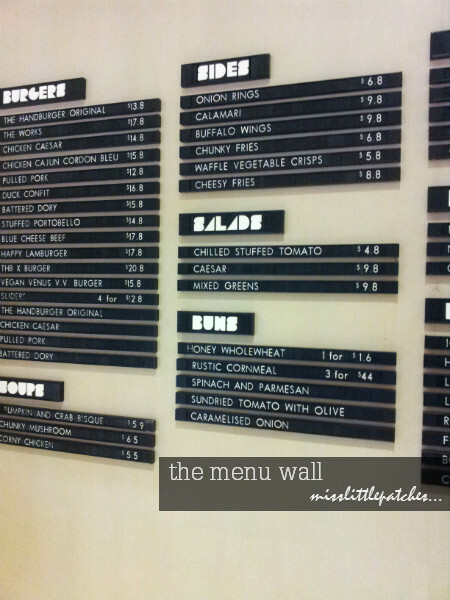 There’s this menu wall outside the Restaurant, quite interesting, can start thinking what to have while queuing. Inside were rows of wooden tables with benches beneath them. Quite old school. Atmosphere was lively, but at times will be quite difficult to hear what my friends are talking. 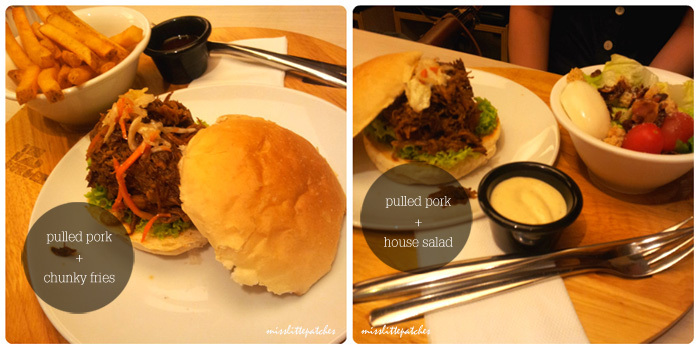 E & T ordered the Pulled Pork Burger (S$12.80), each with Chunky Fries and House Salad. 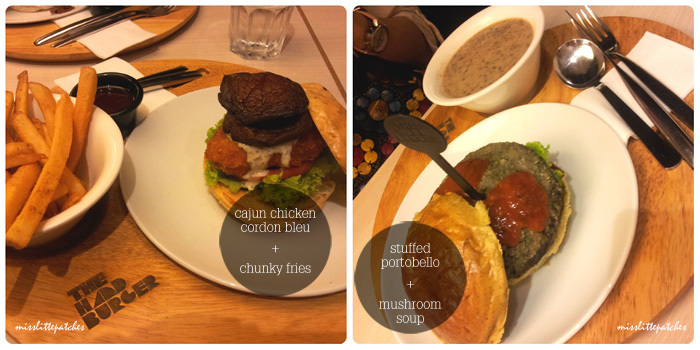 J and I ordered the Chicken Cajun Cordon Bleu (S$15.80) while L ordered Stuffed Portobello (S$14.80). My Chicken Cajun Cordon Bleu was slightly salty for me. And somehow, we kept drinking water while eating, we were very thirsty. Stuffed Portobello was too “healthy”, because it was quite bland for L, he he he… Oh, we’ve ordered Buffalo Wings (S$9.80) too…which I don’t really like. E and I think that it tastes weird. Well, we are not saying it’s not fresh. Erm…don’t know how to put it in words, but the after taste is somehow similar to the feel after you’ve ate those fat yellow noodles… Total bill added up to about S$96, which average about S$19 per pax. Will need to think if there will be a re-visit. After dinner, we went for a walk. For the 2 subsequent weekends, ie. 24-25Aug and 31-1Sep (7pm – 2am), there is this Night Festival going on where you can see performance, music or dance at the heart of Bras Basah.Bugis arts and heritage precinct. The location stretched from The Cathay Building to Armenian Street. There are evens taking place in SMU, National Museum, Singapore Art Museum, The Substation, etc. Quite interesting. 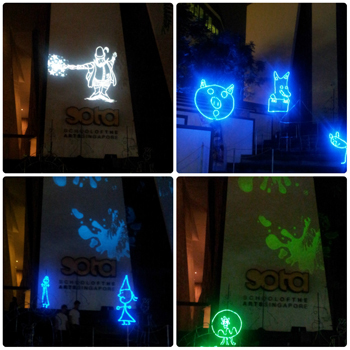 Well, we only managed to get some “Free Running” workshop outside The Cathay as well as Children’s Dream lighting outside SOTA (School of The Arts Singapore)… Dream Lighting ~ You can see how children’s drawings of familiar fairytales characters bright up with sparkles of lights. We are trying to search for our familiar fairytales characters too. Seems to be an interesting event. Hope to be able to explore what’ around National Museum.